End of life is a stage that everyone eventually experiences. While death may come suddenly for some, most people live to an older age and decline slowly. In many cases, this means an eventual confinement to the home or to hospice care, where the individual stays until he or she dies. Sadly, however, this condition is not unique to the elderly: Middle-aged people, young adults, and even children also can become candidates for hospice or palliative care. The decline in the population of the baby boomer generation is the chief reason that hospice and palliative care workers will find themselves increasingly in need in the coming decades. A population that numbered 78.8 million at its peak, the baby boomer cohort is now decreasing steadily, primarily in the manner described: a slow and steady decline in response to illness or simply from old age. Hospice and palliative care social workers are tasked with making the often-difficult transition to end of life an easier process. Specifically, palliative care providers help coordinate the services that allow their patients to manage pain, while hospice social workers are employed primarily by hospices and work to coordinate care within those facilities. While hospice social workers typically facilitate palliative care at some point, not all palliative care providers work in hospices. Almost all healthcare insurance plans provide coverage for both hospice and palliative care. Typically, the general patient’s qualification is a prognosis of six months or less to live. End of life is usually the cause of a terminal illness, an injury that will eventually lead to infection or death, a heart condition, or an ailment with no known cure. Because most people tend to delay enrollment in a hospice facility until it’s absolutely necessary, preferring instead to stay at home in the care of family members or in-home care providers, many hospice social workers do not meet their patients until the last few days or weeks of their lives. Palliative care social workers, on the other hand, often work with patients much earlier in the process. Even Stage 1 cancers, for instance, can cause significant pain; therefore, while the patient might not yet be near death, he or she may require the services of a palliative care social worker. Note that hospice and palliative care social workers, while they may perform some of the same duties as medical and palliative providers, are also typically responsible for a multitude of other tasks: arranging the necessary services, garnering the support of state or federal agencies, working with insurance companies to get services covered, and communicating with families and other providers. The overall objective of a hospice and palliative social worker, therefore, is to coordinate the services that enable patients to receive the best possible hospice and palliative care. These may include, not only arranging for medical services, but also providing for the emotional, psychological, and spiritual care required by many patients who are approaching the end of life. Social workers are typically more active in this role than medical caregivers, and they often see patients on a one-on-one basis to provide talk therapy and other counseling services. The ultimate objective of every hospice or palliative care social worker is to provide the highest quality of life and a modicum of tranquility, not only for the terminally ill patient, but also for the patient’s family members. In their efforts to do so, they must work with other service providers to ensure the patient has the best opportunity to withstand the anxiety, discomfort, fear, and depression that often accompany the transition to death. Additionally, social workers in this field try to assist patients with the often-difficult, but necessary, decisions they must make during their remaining days. The hospice and palliative social worker’s responsibilities may include managing legal matters, such as wills, estates and trusts; communicating with family members; bringing treasured possessions to the hospice center; or managing the care of pets, and more. For patients who no longer respond to any type of medical treatment, the paramount concern becomes ensuring the patient’s comfort and helping the patient tolerate and even celebrate their remaining days in the most pain-free and comfortable manner possible. Hospice and palliative care social workers may find themselves in any number of different work environments. Some, for instance, have their own offices in private practice, or they may work at state or government facilities. They may also work in schools, hospitals, military settings, community centers, and home care or nursing care facilities. A large number of social workers travel, helping coordinate services in a variety of settings. Many spend a lot of time in patient homes, providing palliative care and counseling to their patients at home. One of this career’s biggest challenges is the emotional toll it takes upon the caregiver. The goal of most social workers is to make life as satisfying and painless as possible for those facing terminal illness, but, naturally, this means that on an everyday basis, the social worker encounters a great deal of pain, suffering, and emotional turmoil, both from the patients and from their families. Another primary challenge is the demanding nature of the job. Patients in hospice or who are receiving routine treatment for pain are likely to experience a series of urgent crises, and social workers are often called in to address the situation, coordinate services, or provide counseling in response to each crisis. Some work unusual hours, including evenings or weekends. Many social workers are employed full-time, which, considering the nature of the job, can be very demanding, both physically and emotionally. In this type of social work, therefore, it’s important to get rest and relaxation to maintain the necessary energy and mental resources to respond appropriately and compassionately to the rigors of the job. However, working in this field also provides enormous rewards. For example, Kathleen Green relates a hopeful story for the Bureau of Labor Statistics: A hospice nurse, while caring for a cancer patient, realized that the patient had begun to gain weight. After administering a variety of tests to ensure that the weight gain was not because of the treatment or other symptoms, the nurse eventually concluded that the patient was simply eating more ― as a result of feeling better and happier. These are the types of success stories social workers can expect to experience when they not only help patients get the compassionate care they need, but also to make the experience as pleasant and pain-free as possible. 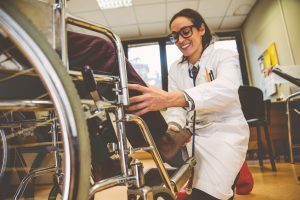 While the Bureau of Labor Statistics does not specifically list hospice or palliative care social worker as a career designation, it details the salary and job outlook of a few comparable roles. For instance, social workers can expect to make an average of $22.54 per hour, or $47,000 per year. The job outlook is good, growing at a rate of 12 percent, which is faster-than-average job growth. Registered nursing, which may provide a pathway to social work, generates an average salary of $32.91 per hour, or $68,000 a year, with a growth rate of 16 percent. It’s safe to say that hospice and palliative care social workers will be able to find work upon graduation, especially with the ever-growing rate of aging baby boomers moving into the medical system and into home care and hospice facilities. Every day, hospice and palliative care workers endeavor to improve their patients’ lives, reduce pain, and help provide serenity in the face of serious illness and eventual mortality. They assess patients, diagnose their pain and emotional condition, and help them access services that will address these issues. In most cases, the worker also provides one-on-one counseling with patients as well as with family members, helping them cope with the approaching loss of the loved one and its attendant grief. Either a bachelor’s or master’s degree may allow entrance into the hospice and palliative care field. However, those who have only a bachelor’s degree likely won’t be able to acquire the most interesting jobs, typically cannot get licensed to provide counseling services, and have little opportunity to apply for leadership opportunities. A master’s degree, on the other hand, grants wider access to working with specific populations (such as ethnic groups, those with certain types of disease, or specific age groups), enables social workers to provide full counseling services, and can eventually lead to much more satisfying roles. Social work master’s degrees are available at both traditional institutions of higher learning and online. Most master’s degrees, which take from one to two years to earn, include a clinical component, of which the number of hours varies depending upon the program type. Coursework includes foundational training in human physiology and psychology, coordinating end-of-life care, ethics, and more. Upon earning a degree, social workers need to obtain licenses and certification, and, sometimes, they must acquire both. At the master’s level, social workers need licenses to enable them to practice counseling and greenlight many of the services they help coordinate. Some receive additional certifications for specific types of care, while all social workers must engage in continuing education of the type dictated by the individual board or governing body that bestowed the license or certification.